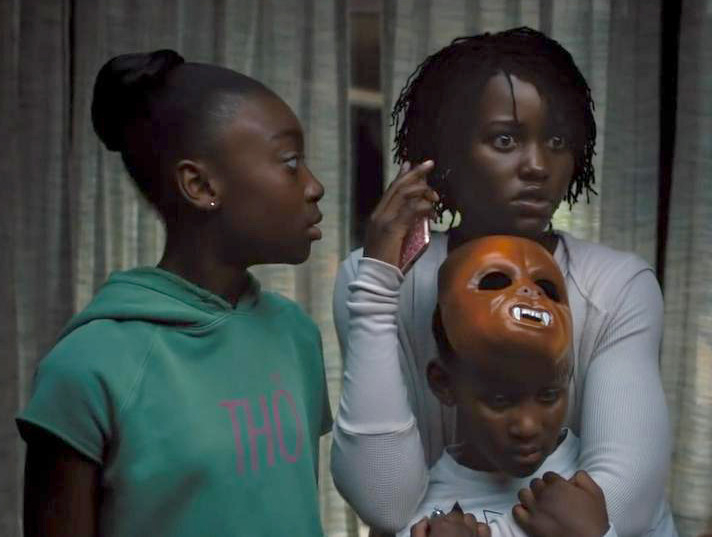 Following the world premiere of Jordan Peele’s ‘Us’ on Friday night at the SXSW Film Festival, the consensus response seemed to involve two somewhat conflicting impulses. One was to talk about the film. A lot. With its layered storytelling, nuanced performances and surprising twists, the movie is quite purposefully designed to start conversations. The second impulse was to see the movie again as soon as possible, if for no other reason than to prove or deny the various theories and readings that sprang from all that talking. In the movie Lupita Nyong’o and Winston Duke play a married couple, Adelaide and Gabe Wilson, who find themselves and their two children under siege at their vacation home by people who seem to be evil-twin versions of themselves (dubbed Red and Abraham in the film’s end credits), who come to be known as the Tethered. Eventually much is revealed about what is going on, but the film’s deeper meanings will likely inspire months of conjecture and speculation. “On the broader strokes of things, this movie is about this country,” he continued. “I was stricken with the fact that we are in a time where we fear the other, whether it is the mysterious invader that we think is going to come and kill us, take our jobs, or the faction that we don’t live near that voted a different way than us. We’re all about pointing the finger. 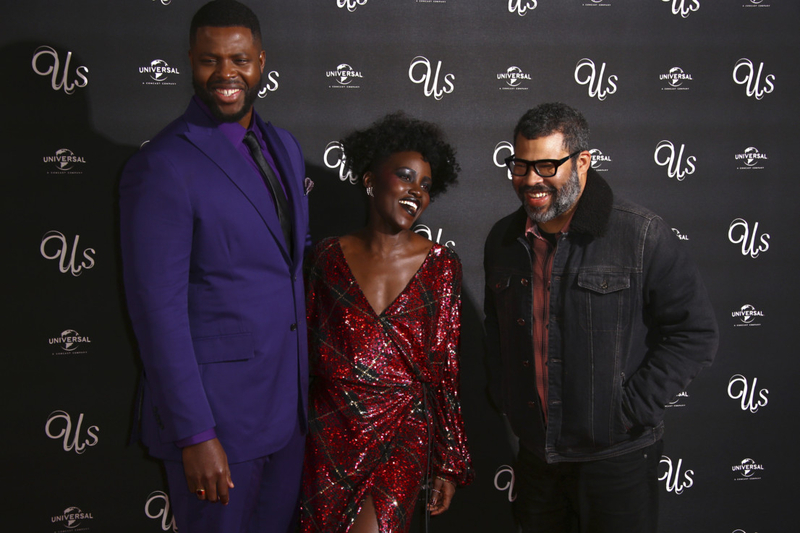 On Saturday afternoon Peele’s two stars, who also collaborated on last year’s blockbuster ‘Black Panther’, seemed as energised as anyone else from the previous night’s audience, buzzing with excitement and brimming with ideas as they sat down for a spoiler-sensitive conversation to parse the meanings and messages of ‘Us’. Warning: Minor spoilers do follow, in case you want to preserve all secrets for yourself until the film opens on March 21. As Jordan Peele’s follow-up to ‘Get Out’, there’s so much anticipation around the movie. What do you hope is going to happen with this movie? Nyong’o: I think the ideal situation is that people run with it. I think Jordan makes films that he wants to live on beyond the cinema. And he wants people discussing them and taking them apart and putting back together. He wants films lived-in by an audience. And so if that happened then it would feel like success. Duke: And I feel like what he does as well is curate conversation. Like ‘Get Out’ did — she [Nyong’o] took the entire cast of ‘Black Panther’ to see ‘Get Out’ after she saw it. Like, “You guys have to see this.” After we talked about it for like 2 1/2, three hours at a bar. ... That was amazing. And with this movie as well, it’s going to be another conversation piece. And I love the idea of changing the future. I feel these movies also make it into an academic canon because there’s so much breaking down and subtext translation to do. I can see this being someone’s dissertation, I can see this in school for a young filmmaker who just wants to find his own space and say, “Hey, Jordan Peele made this lane and I could make my own.” So I’m excited that we might change the future. It’s difficult to talk about ‘Us’ in a way that feels spoiler-free. Have you all talked about how to talk about the movie? Nyong’o: Well, we have talking points from the studio. About what they’re OK with us saying and the things that they don’t want us to say. It was helpful to me because this film is very hard to talk about without ruining it. I think the premise is the thing that we can share because it’s in the trailer — that this is a family going on a vacation and the mother has a foreboding sense of something crazy is going to happen because of a trauma she had when she was a child. And she’s proven right when these four shadowy figures show up at the top of their driveway and the worst nightmare of all their lives ensues from that. And I think saying that doesn’t spoil it and kind of sets it up. And I think also we’ve all been very deliberate about trying to prepare an audience with something that is not ‘Get Out’. There is a grand expectation that he will be carrying on in the kind of racial commentary aspect. And this is not that. I think where Jordan is making strides is by putting black people in the centre of his narratives and showing their unremarkability and that’s what this film is about. Their blackness is not the thing in question. It is just their norm and something else, some other monster is coming for them. And it’s very important to prepare an audience for that — to love ‘Get Out’ but leave it outside and walk into the cinema to experience something else. I want to ask about playing the dual roles. Lupita, for you especially your physicality changes entirely in the way that you carry yourself, the way that you hold your face. How did you create those distinctions between the characters of Adelaide and Red? Nyong’o: I worked very hard at trying to delineate the two and it was about very painstakingly creating a physical, emotional and psychological vocabulary for each one of them. And for me, what cracked it open was figuring out the physicality after all my research was done. I went into the physical work of it. A governing factor for me was that Adelaide I approached with a more naturalistic style, and with Red, I was definitely more stylistic. And then within that, Jordan gave me specific words that he felt represented each one. And I basically ran with those. [One thing] I knew about Adelaide is that she has a past in dance, and so having the residue of a dancer was something that I really worked on. I did ballet classes and that sort of thing. And then with Red, he used the words “queen” and “cockroach” and those two words are so dissonant, but they made a lot of sense to me because you know the thing about a queen — I don’t know that I can talk about this without spoiling it. I’m getting nervous now. Duke: I think what’s also one of the big strengths, is that the movie means so much and the movie is so multifaceted that unless it’s literally the one big twist, I don’t think you can ruin this. Nyong’o: OK, cool. So anyway, the queen and the cockroach thing, they seem kind of diametrically opposed. But there is the kind of regality but also with the determination and surprise of a cockroach. A cockroach can be completely still and then just dart and scurry and they’re survivors and they’re also the things that we dread. When you see a cockroach, things are not good. Those two things really helped to inspire the direction I went with both characters. Winston, at the premiere you said that you didn’t see your alternate character of Abraham as a villain. And there is perhaps a way of looking at the entire story from the Tethered’s point of view. Were you really conceiving what Abraham’s view of the story was? Duke: One-hundred per cent. And one thing that really helped me flesh out the difference between the two characters, and I’ll reiterate, is function. I felt Gabe is a husband, right? So he believes he can lead, he is the husband. He is, “My way goes at the end of the day, I bring home the bacon,” he applies normal societal conditioning. I believed Abraham is much more of a partner. Abraham is there to make sure that the mission succeeds. Abraham is there to listen and make sure that [Red’s] communication is clearly heard and felt, and anything outside of that is unacceptable. I definitely felt like it was a different movie from their standpoint and I saw their need for experience and their need for liberation. I believed it really should have the audience question where they sit in the dynamics of privilege and lack of it. What kind of conversations did you all have about the meaning of the movie, and how much are you talking about the thematic resonances as you’re in the process of making it? 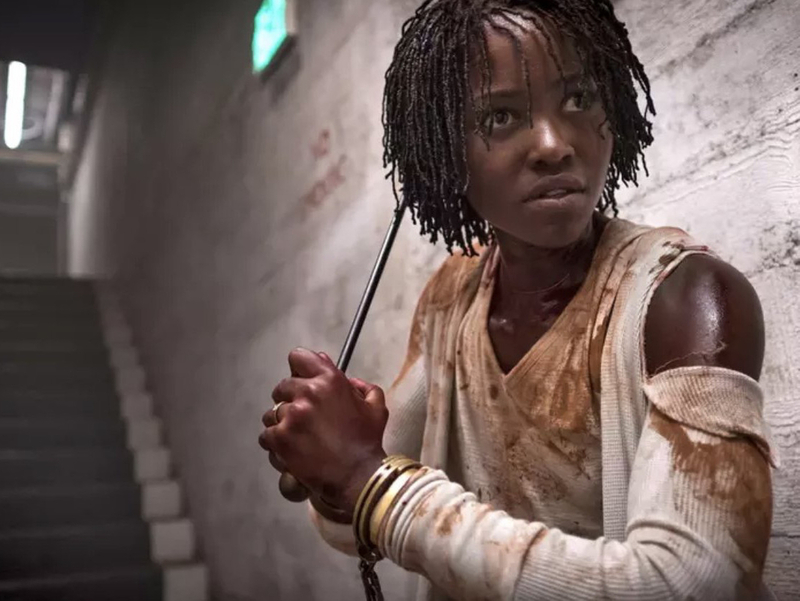 Nyong’o: With this movie, because it’s very much from the mind of Jordan Peele, and the rules of the world were something that he dreamt up, it was really important for us to understand what he was trying to do. For me, those kinds of questions were in the beginning of the process a whole lot more. I wanted to make sure that I was picking up what Jordan was putting down and that I understood the themes, I understood the messaging, I understood the philosophy. And then as we carried on in the shoot, because this is such an intellectually taut film, oftentimes we did have to revisit some of those things. But I try very hard to separate the cerebral from the emotional performance. Like Winston says, we are led by our emotions, our needs, not necessarily by our intellect, and so when I’m working, once I figured out the intellectual, the cerebral, I tend to try and translate it into action, into emotion, and lead with that. So in that moment I’m not thinking about the existential conversation, I’m thinking about what it is this character wants to convey. Duke: I definitely leant into more of the intellectual side, but it’s still manifested in exactly what Lupita just said, understanding what the intellectual intention is, understanding the intention of the allegory that’s at hand. And then translating that, because I think one of our main jobs is translation — translating ideas and verbiage and intention. But there’s a lot of duality in the film that I will call incredibly Peele-ian. It’s very Peele-ian in that an image or an action means something totally different depending on the scene and in juxtaposition to what it’s against. If it’s Gabe, it means something totally different with a wife like Adelaide, Abraham means something very different next to Red. It’s very important to understand those things. US releases in the UAE on March 21.